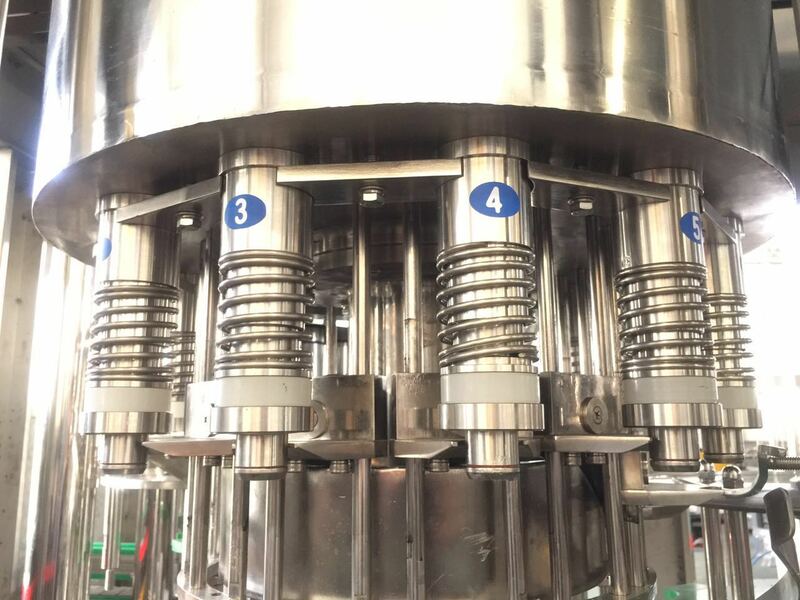 The bottle through the empty bottle conveying system to enter the filling machine to divide the bottle to the bottle, the bottle clamp which is arranged on the dial wheel to separate the certain distance from the bottle to continue to feed into the three one machine. The rotary disk is provided with a flushing bottle machine card bottle type stainless steel bottle holder, bottle bottle clamped along the guide rail flip 180 degrees, so that the bottle down. In a specific area of the bottle, the bottle is sprayed with the nozzle and then the water is sterilized and washed. After disinfection, rinse the bottle in the bottle, and then clamp down along the guide rail and then turn 180 degrees, the opening up. Pull the wrench on the wheel and remove it from the bottle and feed it to the filling machine. Into the filling machine bottle by bottle lifting mechanism on the clip stuck bottle keep, in the bottle lifting mechanism and a cam realize rise and fall. 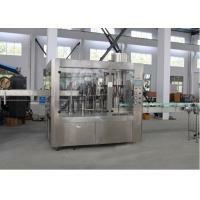 The bottle lifting mechanism to complete the filling process the bottle to rise, open top filling valve. 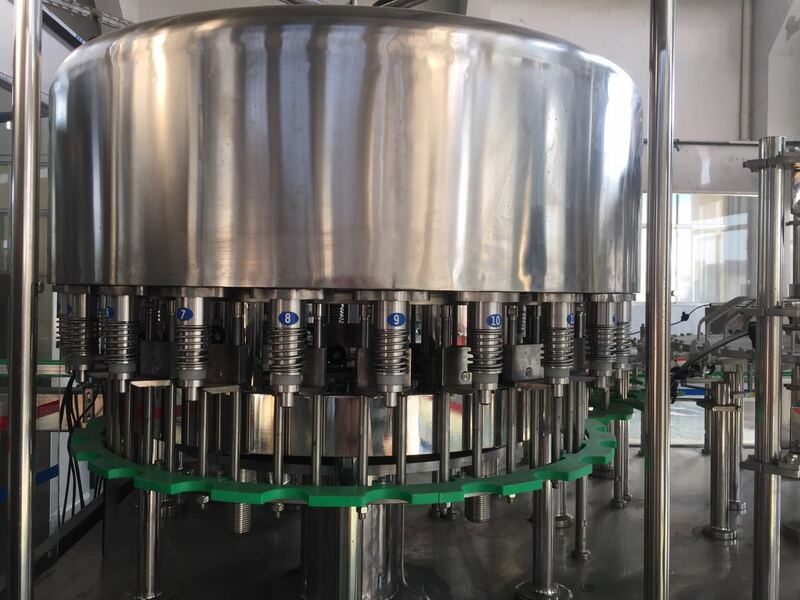 After the end of the filling, the bottle lifting mechanism is decreased, which is reduced to the lowest level, and the bottle filling is finished by the transfer wheel on the transitional wheel. The stop knife on the capping machine is stuck in the bottle neck, keeping the bottle upright and preventing the rotation. 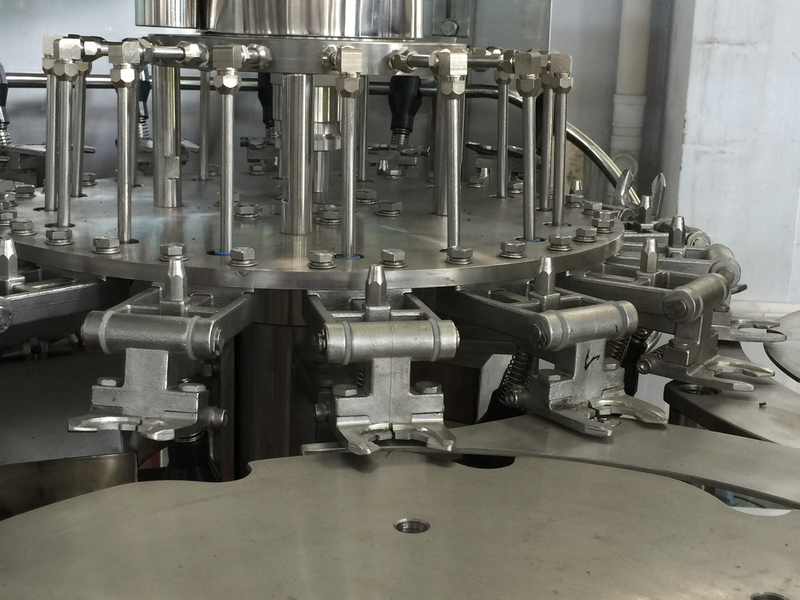 Rotary lid on the capping machine keep revolution and rotation, under the action of the cam to realize grasping cover, sleeve cover, a rotary cover, a cover removing action, the capping process is finished. The product bottle through the bottle cap from the screw cap machine to the delivery chain, from the conveyor chain to send a three. 2. You are welcome to come to visit our factory,and see the machine running. 1. We can design the machines according your requirements(materil,power,filling type,the kinds of the bottles,and so on),at the same time we will give you our professional suggestion,as you know,we have been in this industry for many years. 2. When you finish the Preparation conditions,our fast and professional aftersales service engineer team will go to your factory to install the machine,give you the operating manual,and train your employee until they can operate the machine well. 6 . 24 hours for engineer response (all services part 5days in customer hand by Intl' courier). 7 . 12 Months guarantee and life-long technical support. 9. Good after-sale service offered, please get back to us if you got any questions. We have the single quality department,that make sure the material of the raw materials is good,and ensure the machine running smoothly. If you want to know more information about the product,You can send an inquiry, we will solve any of your problems and send you running vedio.